Wage Drift is the difference between the wage actually paid to a worker and the wage negotiated. It can be defined as the difference between the wage rates CFA® Salary GuideThe median CFA® salary is approximately $180,000 in the United States while average total compensation over $300,000. Learn more about salaries, compensation, and what your expectations should be as a financial analyst in equity research, FP&A, portfolio management, and other areasnegotiated by a company and the wages actually paid to the workers by the end of the period. Overtime – Overtime is when the company asks its workers to provide extra hours of work to meet high demand or other requirements. The company must pay its workers an amount more than the salary for the number of overtime hours contributed. Overtime is paid only if the wage negotiated does not include the overtime component. Bonus Payment – Bonus is the amount of salary paid over and above the wage. The bonus amount can be specific or on an hourly basis. Bonus payments can be for a worker outperforming in his work or for all workers when a company achieves its goal on or before time. Shortage in the Workforce – Wage drift can also happen when the company is unable to hire new or extra workforce when required due to a shortage in the labor market, because of which the current workforce need to work for double shifts. When the earnings of a worker increases in terms of the salary paid due to overtime or other factors. The occurrence of wage drifts can be due to an increase in the final payment of the salary. Wage drift can also occur when the salary or wage paid remains the same, but the workforce was underutilized. It is when there is a fall in output, but the wage remains the same and thus, the per unit cost of the company rises. Wage drift provides a worker with a higher wage rate than the national wage rateFiscal PolicyFiscal Policy refers to the budgetary policy of the government, which involves the government manipulating its level of spending and tax rates within the economy. The government uses these two tools to monitor and influence the economy. It is the sister strategy to monetary policy. upon which the salary or wage was fixed. However, it can also be a disadvantage from a company’s point of view. It makes it difficult for the company’s human resource department to precisely predict and fix wages. Factors that generally cause it include non-controllable factors such as a sudden increase in market trendsMarket EconomyMarket economy definition - a pure market economy is an economic system where there are no regulations and players are free to trade as they please, due to which there is an increase in demand for the product. Thus, wage drift makes the work of human resource more difficult in deciding the workers’ wages. 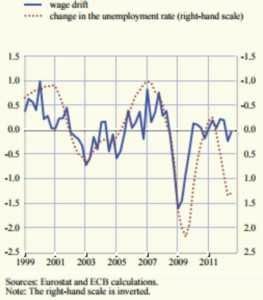 In the graph above, it can be seen that the wage drift in the euro area is an aggregate measure and is subject to a number of factors. It indicates a cyclical adjustment in the area. The change in inflation and wage growth is typically not indicated by the negotiated wage and thus, wage drift is used to show said change and growth. 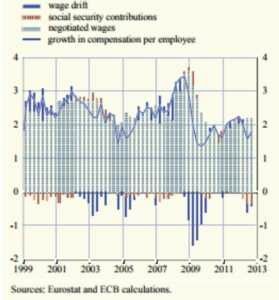 It can be seen in the graph above that the wage drift in the subdued growth period, i.e., 2003-05, caused a downward effect on the compensation per employee. On the other hand, during the financial crisis of 2008, wage drift led to an upward impact. It shows that tightening labor markets make wage components like overtime and bonus pay increase more quickly than the basic salary or pay. During the downside period, wage drift went on a decline as well with a negative percentage of growth in the compensation per employee. In 2010-13, it was relatively balanced as a percentage of the overall labor cost.